Apple is planning to launch Apple Pay in Canada later this year, according to The Wall Street Journal. The report, citing people familiar with the matter, claims Apple is in negotiations with six Canadian banks about a potential November launch of the mobile payments service, which debuted in the United States last October and has yet to become available in other countries. The six Canadian banks reportedly in talks with Apple include the Royal Bank of Canada, TD Canada Trust, Scotiabank, Bank of Montreal, CIBC and National Bank of Canada. The financial institutions, which together account for more than 90% of Canadian bank accounts, are open to supporting Apple Pay in Canada, although have expressed concern about higher fees and potential security issues. "The banks are open to an agreement, but they aren’t happy with Apple’s fee proposals and are concerned about security vulnerabilities like the ones that U.S. banks experienced as they rolled out the service, the people said." Canada is a well-prepared candidate to receive Apple Pay support, as many retailers and businesses across the country are already equipped with contactless payment terminals that are required for the iPhone-based mobile payments service. The country was one of the earlier adopters of Chip-and-PIN debit and credit cards that can be tapped against a payment terminal when making a purchase, and Apple Pay would be a natural extension of that functionality. The six Canadian banks have reportedly formed a consortium and hired consultancy firm McKinsey & Co. to develop a security protocol for Apple Pay. The financial institutions have also considered the need for secondary authentication to verify customer information, such as entering a PIN, logging on to a mobile banking app or using a one-time passcode sent via text message before cards can be used on Apple Pay. Apple announced last year that it is targeting international expansion of Apple Pay, and speculation has mainly been focused upon Canada, China and the United Kingdom. Apple's efforts to launch Apple Pay in China have faced some roadblocks, however, and Apple's talks to roll out Apple Pay in the United Kingdom during the first half of 2015 are similarly stalled as some banks are concerned about potential privacy issues. I don't get why people hate on apple for not releasing things worldwide. If they had a choice why wouldn't they? They have to work with that countries rules and regulations and get all sorts of clearance. For example iTunes Radio in Canada, they likely have to go through CRTC and boy are they a bunch of *******s. I'm sure each country has its own organization that apple needs to negotiate with before launching services. I wouldn't get your hopes up. UK Banks are not at all happy with Apple Pay's security. (http://www.theverge.com/2014/12/29/7459925/apple-pay-uk-launch-2015-banks-fear-invasion) I highly doubt our banks will give any control over to Apple. And rightly so. Why rightly so. The UK banks are money grabbing shysters!? And the basis of the 'unnamed' bank argument is null and void as no data is collected by apple - "So when you go to a physical business and use Apple Pay, Apple doesnt know what you bought, where you bought it, or how much you paid for it. The transaction is between you, the merchant, and your bank." And as for security. No other payment method is as secure. Period. Also. Doesn't really have anything to do with the banks - If barclaycard or Visa implement it. and they will then that's that. RBC isn't happy with the fee structure. What a load. Their random 'fees' have been dinging my accounts for no reason for years. I'm sure that what's upsetting them has something to do with how they can squeeze more fees out the people using the bank. Still, must say that I am looking forward to this. I only hope the banks don't mess it up. I still don't get why Apple didn't roll this out here first. Pretty much every single terminal I encounter on a daily basis has NFC built in unlike in the US. My only concern is I have a GREAT cash back credit card that we use for all purchases. 4% on gas and groceries, 2% on drug stores and recurring payments and 1% on everything else. I wonder if I'll still have these perks if paying through ApplePay? Is there a precedent for a card like this in the US? 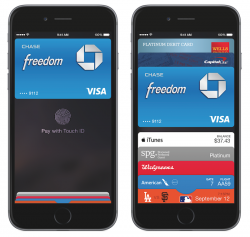 Do the rewards stay the same regardless of if you pay with the card itself or with ApplePay? You will still get the perks.